This Saturday sees the Swans travel to Ashton Gate to take on Bristol City in their latest Championship fixture. It has been an eventful week for Swansea to say the least. The Swans played out a 3-3 draw with Birmingham City at the Liberty Stadium on Tuesday night, which was a disappointing result for the home fans, given that Garry Monk’s Birmingham side played the entire second half with ten men. Following on from that, it was quite a Transfer Deadline day with the Swans set to lose four players on Thursday, with Jefferson Montero, Wilfried Bony, Leroy Fer and most controversially Daniel James seemingly being sold on with the owners’ latest cost cutting exploits. Thankfully the Fer and James deals did eventually collapse at the last minute, but then it was announced that Tom Carroll had left the club on loan to Aston Villa. Bristol City have been out of action in the Championship since the 19th January, but did win last week in the FA Cup against Bolton. The result was Bristol City’s sixth win in a row in all competitions and they are unbeaten since the 24th November, so this will be a very difficult game for Graham Potter’s side especially as their record at Bristol is far from good. Take a look at all of the historical results between the two clubs since their first meeting way back in 1922, when the Robins beat the Swans 1-0 in Division 3 [South], on our Bristol City v Swansea City Head to Head Statistics page. Experienced referee and former postman, Andy Woolmer is an experienced official will be the man in the middle when the Robins entertain the Swans at Ashton gate this weekend. The last time he was the referee for a Swans game, was back in December, when the Swans ran out 3-2 winners at Brentford. This will be the first time he has been in charge of a Bristol City game this season. This Saturday’s game is a difficult one for the Swans, with the Robins unbeaten at home in the league since November. Bristol City are also in excellent form and they have had a free week this week, due to not being involved in the midweek Championship fixtures, so will be the fresher of the two sets of players. In addition to this, Bristol City had a quiet transfer deadline week, whilst Swansea’s squad would have had disruption and uncertainty as players departed, others seemed certain to leave only to then return and I would expect this upheaval to have a big effect on the squad. I would also be surprised if Daniel James and Leroy Fer were to start (and perhaps not be involved at all) as their deals fell through quite late on Thursday night. As much as I don’t like tipping the Swans to lose, I do feel that the odds of 11/8 (2.38) of Bristol City to win the game are quite generous given the above factors. 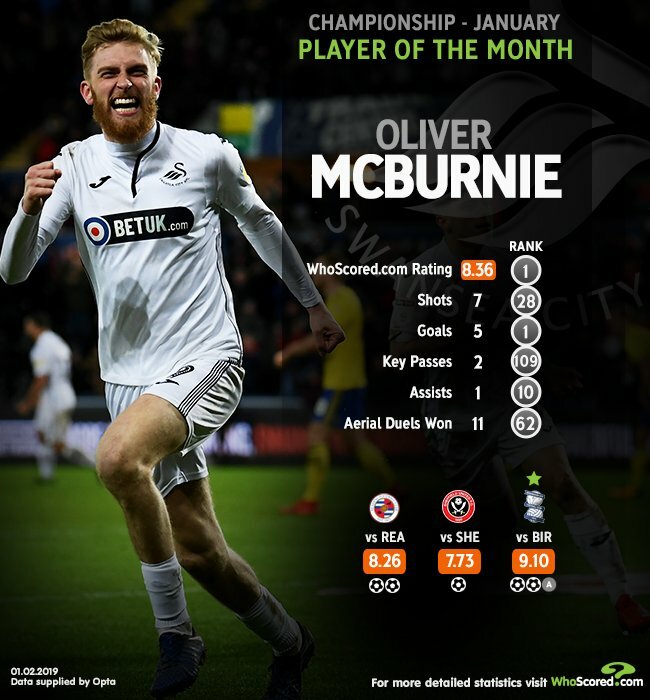 For fans who would prefer to back a positive outcome for the Swans, then the obvious choice for this is for Oli McBurnie to score the first goal. Oli has bagged five goals in his last three games and was this week awarded the Championship Player of the month by WhoScored. You can get odds of 11/2 (6.50) are available for Oli to break the deadlock, with the Swans Official sponsors BetUK. This week’s ACCA selections are Aston Villa, Sunderland, Bury, Lincoln and Forest Green. The ACCA pays around 24/1 (25.00) with MarathonBet. Bristol City to win – 11/8 (2.38) with BetVictor. First Goalscorer – Oli McBurnie at 11/2 (6.50) with BetUK.